In democratic societies, the gap between the existing social order and its claim to universal inclusion (i.e. equality) generates politics. Some commentators have claimed this gap is now closed, dissensus being barred by an institutionalized presupposition of equality. This chapter examines the spatial and urban implications of this reading of politics. We argue that the idea that politics requires dissensus presumes a stage for politics exists. Following this, we show that although we might pre-suppose common spaces where politics happen, these spaces are not fixed or contained. Just as there are no predestined political actors, there are no spaces that are definitively political. 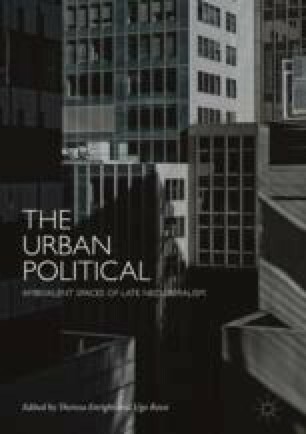 In conclusion, we consider how our reading of urban politics informs understanding of urban change and democratic ideals.